Pilot Record's Inter City Music Festival recently took place at the Golden Sands Beach in the Huangdao district of Qingdao, China. Many of record label's acts performed including Reflector, Zheng Jun, CMCB, Twisted Machine and headliner Miserable Faith. 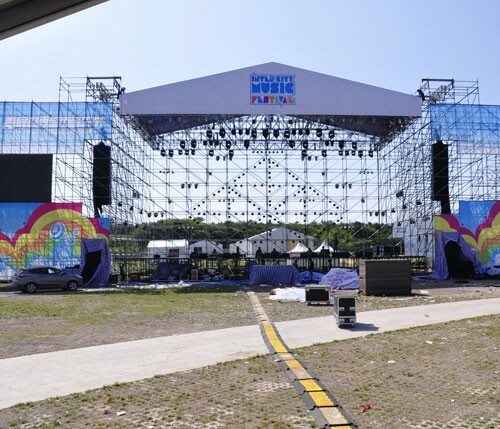 Real Music Acoustics & Lighting Technology Co. Ltd., Adamson System Engineering's distributor in China and Hong Kong, supplied an Energia E15 line array system for the two-day festival. "The record label's artists represent many different genres of music," explains Richie Wang, GM for Real Music Acoustics & Lighting. "We provided a substantial Adamson E15 PA in order to accommodate their heavy metal bands as well as pop and folk music acts." The E15 line arrays – 12 enclosures per array – were hung from scaffolding erected to the right and left of the stage. Under each array were a stack of six T21 subwoofers sandwiched between double stacks on each side – a total of ten subs per side. Stage monitoring was serviced by two M212 low profile monitors while front fill was provided by eight M15 placed equidistant along the lip of the stage. "The system really sounded fantastic," Wang adds. "No matter who was playing, the sound quality was unmistakable. The Pilot Record management team were extremely impressed."